When you are mastering the art of piano, there are a few details that can make all the difference. The importance of piano benches is often overlooked, but they are an essential part of the assembly and can really improve your performance. A good piano bench helps to improve your posture and provides comfort and ease while playing the instrument. 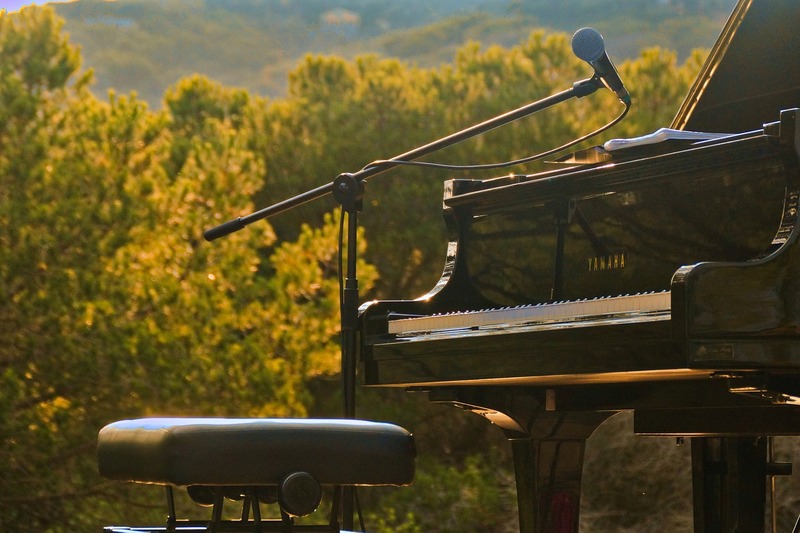 In this article, I will be reviewing the 5 best piano benches that I came across on my quest to find the cream of the crop in the market. The Songmics piano bench provides comfort and convenience with a simplicity that never goes out of style. The Yamaha padded piano bench combines compactness and affordability for all the pianists on the go. Enjoy piano lessons or a duet performance on this spacious and comfortable piano bench. Get a rustic, vintage feel from the fine wood construction along with height adjustment and luxurious comfort. A simple, cost effective and resilient piano bench that gets the job done. Songmics Padded Wooden piano bench is a great option for those who need to sit and practice for long hours. The padded bench top has good springiness and is very much like a cushion with an elegant faux leather finish to spruce up your place. The solid wood construction can hold up a fair amount of weight and the bench is surprisingly easy to assemble. What I like the most about this bench is its storage compartment. It is a very convenient way to keep all your essentials, including your music notes and sheets, at one place and easily accessible. The bottoms have rubber pads to give the bench a good grip on the floor, so it doesn’t move when you adjust your position. I don’t have any doubts about the durability of the bench as the strong wooden legs seem very promising. The only thing to consider when buying this piano bench is its height. The legs are non-adjustable so you need to be sure that the height of the bench works well with your posture and enables you to maintain a comfortable position in relation to the piano. You can also use it as a home décor piece or a vanity table. The soft leather cover is waterproof and very easy to clean. I found this piano bench very handy and convenient. Yamaha PKBB1 X-Style Bench is foldable so you can carry it along with you for gigs and tours, or perhaps even a teaching lesson. The seat has 3 inches of padding that doesn’t sink in during long hours of practice. The steel construction is quite sturdy and also gives you the freedom of adjusting the position of the bench in relation to your height and comfort. There are 3 positions with height adjustment between 19 to 21 inches. It is fairly easy to make the switch, all you have to do is flip it over and adjust the clamps at the back. 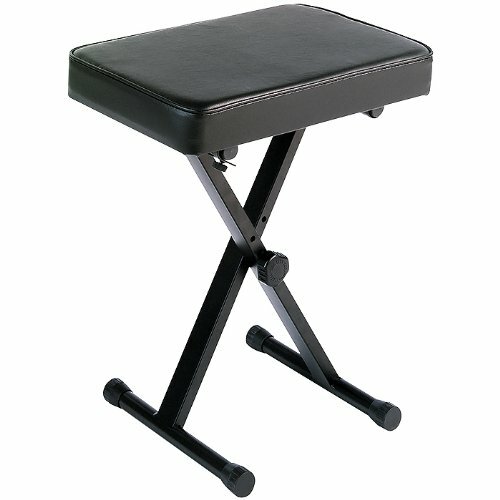 As for the durability of the product, we all know that Yamaha has a good reputation so you can enjoy this portable piano bench for a long time. The seat has a nice black finish that gives it a nice, classy touch. 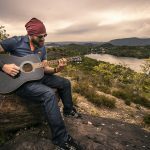 It is good for beginners as well as professionals who need to travel and move around with their instruments, as it’s light in weight and easy to store and carry. The only downside is the grip of its legs on the floor. If you lean forward, the bench lifts from the back too and can feel a little wobbly. Other than that, it’s a solid product and a good investment for all the piano enthusiasts. This piano bench can seat more than one person, which is primarily the reason for its appeal. 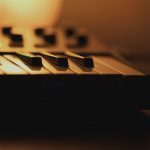 If you are a beginner who needs piano lessons and a mentor beside you, this is a great option for you. It is also good for duet performances on the stage or to give you some extra space for comfort and storage if needed. The bench also has storage space under the seat. Bonnlo Brown Duet Piano Bench is surprisingly large and sturdy enough, not just for sheets and notes, but for books and heavier accessories as well. It has a solid and durable wood construction, so the height of the bench can’t be adjusted. 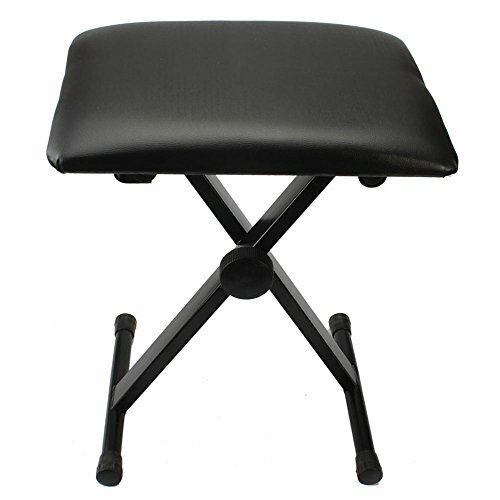 The seat has thick padding to give you the ultimate comfort for long hours of practice. The brown leather covers are easy to clean and waterproof. 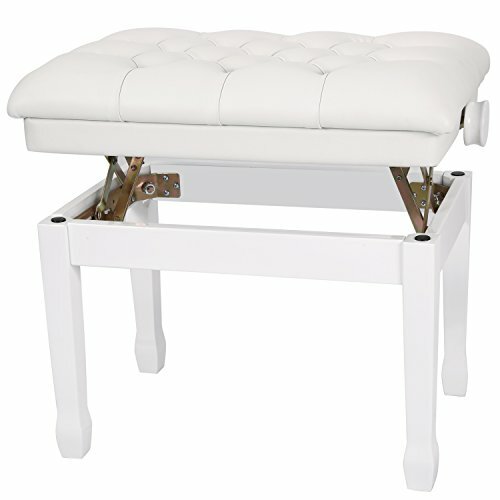 The bench has an easy assembly and all the hardware is provided in the package so you won’t need any additional tools. The legs have rubber pads underneath for grip and stability without damaging the floor. It comes with a good warranty and returns policy so you can be confident about your purchase. This is one of the pricier options in the bunch, but you’ll surely get your money’s worth with the appealing features and well-designed construction of this piano bench. Neewer Height-Adjustable Piano Bench blends well with digital keyboards and upright and grand pianos. It is a good choice for beginners and professionals alike and can be used in concerts, teaching institutions, homes or churches. Treat yourself to the luxurious, fine faux leather finish seat that’s smooth to touch and comfortable enough for long hours of practice. The wood frame has a solid construction and is quite sturdy with an appealing gloss finish. What I like the most about this bench is that it combines the sturdiness of wood along with the option of height adjustment. The sides of the seat have screws to roll it up from 18 to 22 inches. The assembly takes less than 5 minutes and the seats are waterproof and easy to maintain. If you are okay with spending a little more, this piano bench is a great choice. 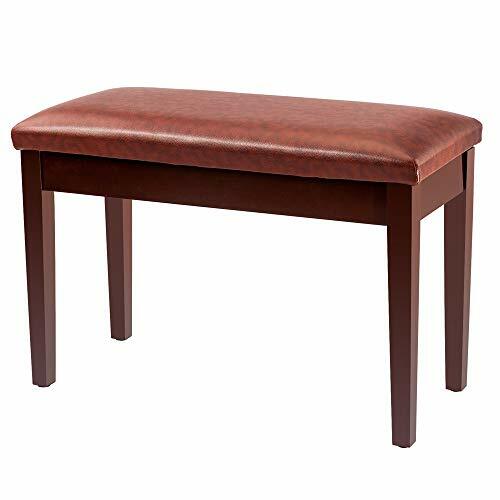 I recommend this piano bench for those who are still at a learning stage and need decent quality and comfort for long hours of practice at an affordable price. The heavy-duty steel construction of the legs cannot be underestimated. 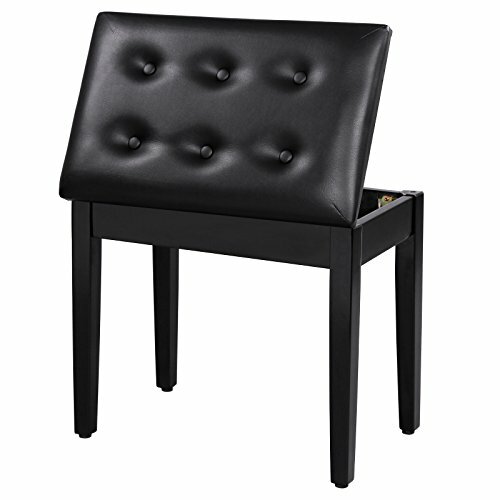 Kuyal Piano Bench has an easy screw fixture to roll the seat and adjust it from 18 to 20 inches. The rubber end caps under the steel legs are a nice addition that protects the floor and doesn’t make the seat wobbly, which is often the case with the X braced steel benches. The seat is thick and has some amount of cushion padding but mostly feels firm to sit on. It is very handy, light and can be folded up for easy storage or carrying around for lessons or gigs. For the given price, it is quite strong and functional and will last you a long time. All the prospective bench buyers should know that the demands of a piano bench are quite different as compared to a regular bench. The most important thing is your comfort and unobstructed performance at all times. This is governed by the height, and the posture you maintain while you are seated on the bench. Therefore, it’s wise to go for a piano bench that has an adjustable height. The comfort and support you get from the seat directly affect the quality of playing and performance. The thickness of cushioning, firmness and a sturdy cover that doesn’t let the seat sink are all important factors to consider. The frequency of use should also be kept in mind as some benches have a tougher construction with durable legs for everyday use. Based on your requirements, you can either go for leather, common duet, adjustable or swivel stools. Lastly, don’t forget to match the piano bench with the style and color of your piano, as both pieces should complement each other in looks and dimensions.